After a tame (almost boring) start to the 2015 Super Bowl, the second half had you on the edge of your seat! The game was painfully close and with less than 2 minuets left the Seahawks chose to throw the ball at the 1 yard line allowing the Patriots to intercept and win the Super Bowl and take home the Lombardi Trophy for the 4th time. 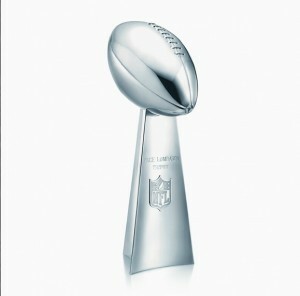 The Lombardi Trophy has become one of the world’s most prestigious sports awards. It is named after legendary NFL coach Vince Lombardi. The idea came to be in 1966 when NFL Commissioner Pete Rozelle had lunch with Tiffany & Co. VP Oscar Riedner and he [Riedner] sketched out what would become the Lombardi Trophy. Originally named “World professional Football Championship” trophy, it was renamed in 1970 to honor the great NFL Coach Vince Lombardi, who had lost his battle to cancer. Lombardi had led the Green Bay Packers to Victory in the first 2 Super Bowl games. It has also been referred to as the Tiffany Trophy. The Lombardi trophy is an extremely elegant and simple design standing 22 inches tall and weighs 7lbs, it depicts a regulation football in a kicking position in a 3 concave sided stand made entirely of sterling silver! The trophy uses a heavy gauge of silver that is difficult to bend and shape, so the manufacturing process demands great expertise. First a spinner places onto a lathe a wooden chuck carved into the shape of half a football. A thick sheet of silver is placed on the chuck. With forming tools, it’s spun until it assumes the shape of the chuck. After both halves are formed, they are soldered together to form the ball. Then a silversmith hand chases the seams and laces onto the ball so that it resembles an actual football. The base is formed from sheet stock, which is hand hammered and soldered. The football is attached by a silver rod that comes up through the base and is secured by silver nuts and bolts. This entry was posted in Uncategorized on February 2, 2015 by Spike's Trophies.